At 20,320 ft Mt Denali (McKinley) is North America's highest peak. 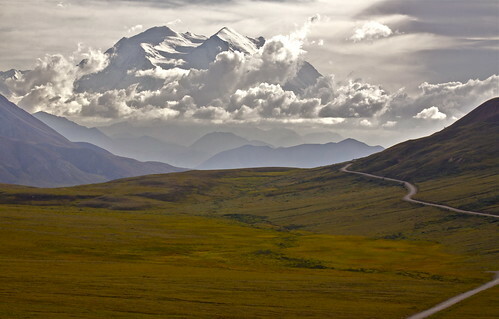 Denali NP is a mixed forest, a taiga of conifers at lowest elevations; tundra at middle elevations; glaciers, rock, and snow at highest elevations. Many visit Denali National Park hoping to see Mt Denali (McKinley). Only one out of three see it due to cloud cover. I was one of the lucky ones. It is truly astounding, made hauntingly beautiful by the surrounding landscape.